Planning for a trip can be overwhelming. When life is pulling you in a million different directions, packing is easy to push to the back burner. I get it. I’ve been there. In fact, I used to be one of the worst packers. I was always lugging around a giant bag that seemed to have everything except what I actually needed. Fortunately, throughout my many years of stuffing suitcases, I have learned a thing or two. 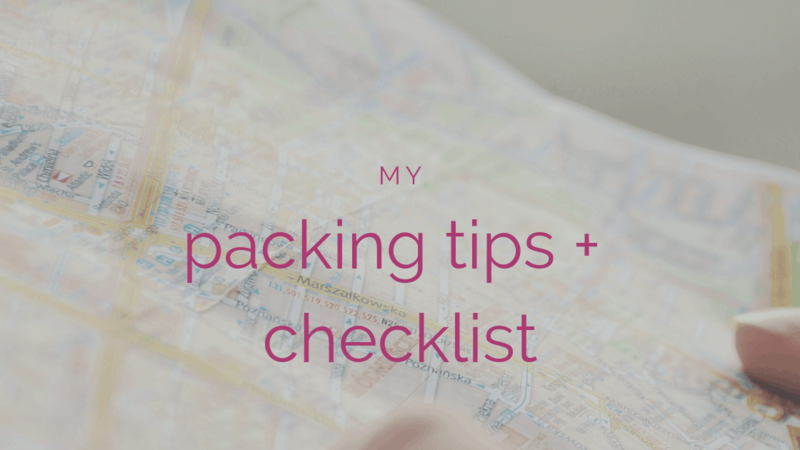 Here are some of the best packing tips and tricks that I have picked up along the way! I’m sure many of you have been here before. You end up just bringing everything so you can pick out what you need when you get there! A smarter choice is to bring classic and flexible clothing items you know you will wear. A quick way to eliminate extra baggage is to try on what you think you might wear before. Sometimes the outfit you thought would work doesn’t look exactly how you pictured it (and that’s okay!). It’s better to know before you get there. Bringing staples that you can layer, mix & match, or dress up will give you a more dynamic wardrobe on the road. I love bringing a couple of different basics and then layering or accessorizing with artful pops of color. Packing efficiently is all about maximizing your space. Rolling your clothes is a great way to to make the most out of even a small suitcase. It keeps your clothes from getting wrinkled, too! To make this method even more effective, fold your clothes first and then roll them to fill every inch of your suitcase. Be sure to put your most bulky items, like shoes and coats, at the bottom. Another great way to utilize all your space is to store items in your shoes and put small clothing items in the gaps. Bonus tip: Packing your jackets and blazers inside out will minimize wrinkles and reduce the risk of stains! Plastic Bags + Plastic Wrap Can Be Your Best Friend! Shampoo? Ziplock bag. Dirty clothes? Ziplock bag. Bringing different size plastics bags is a great way to stay organized and clean while you are traveling. Putting toiletries, makeup, and other spill-prone items in baggies will save you from a messy toiletry disaster. Using a large plastic bag for dirty clothes will keep your other clean clothes fresh and make doing a quick laundry load much easier. If you are someone who constantly finds themselves digging through your suitcase to find what you need, take this one step further; put t-shirts, pants, cardigans, etc. all in differently labeled, plastic bags. It will reduce the amount of damage you do next time you dig through your suitcase! Plastic wrap is another great way to keep your things arranged nicely. For necklaces and bracelets: lay out a piece of plastic wrap, put your jewelry stretched flat out, and add another layer of plastic wrap on top. Then, fold it up and store it somewhere safe. This is a super cheap and effective way to keep your jewelry from tangling! Plastic wrap is also another great way to keep your products from leaking. I like to save travel size bottles and reuse them to fill up with body wash, shampoo, contact solution, perfume, etc. Before I close the lid, I add a layer of plastic wrap over the top to keep it secured. Traveling can expose you to lots of different germs and can leave you with an overall feeling of uncleanliness. To boost my cleanliness and comfort while traveling, I bring sanitizer, deodorant, makeup wipes, gum, a change of clothes, and a neck pillow. If you’re flying, I recommend keeping these in your carry-on. This way you can freshen up during your travels and will have a few necessities if something tragically happens to your luggage. Not only will this protect you from the crazy amount of germs at the airport, but it can help boost your morale along the way! Simple but necessary! Make sure you check your individual airline’s policy before you go. Paying a costly over-weight baggage fee or scrambling to move clothes around in the airport is not the way you want to start the trip. Even if you aren’t traveling on an airplane, make sure you are comfortable carrying the amount you are bringing along with you. Everyone knows the sinking feeling of forgetting something after it’s too late to turn around and grab it (even if you’re a seasoned traveler). What’s worse is when it’s something that will significantly affect your travel. That’s why taking time to make a list (and check it twice) is SO worth it. I’m a huge lists girl, but I know not everyone has time to think through a detailed list of everything they need to pack. That’s why I’m sharing my packing “must-haves” with you! This ultimate packing guide will give you the peace of mind that even if you throw everything together at the last minute, you are going to be OK. Download it today and travel a little easier next time.